Behold a genius creation! Ok so maybe I’m overselling it and I’m sure this is nothing new, but it’s new to me and I love it! Truth be known, I got the idea to do this because a nut mix I had in the car got overheated the other day and the little dark choc pieces melted to create one big piece of nutty chocolate - it was yum. I can down half a bar of chocolate in no time, and although there are some great dark chocolates that are relatively low in sugar, I wanted to make the chocolate go further and up the nutritional content. 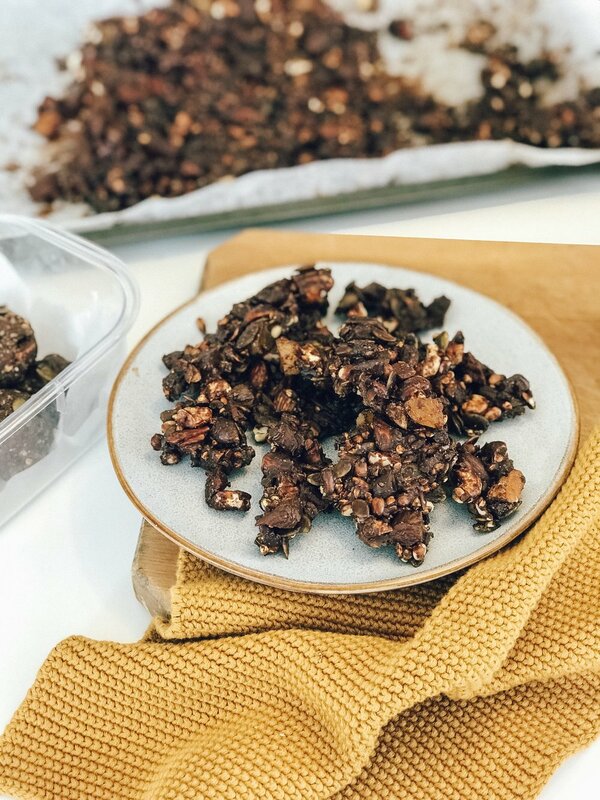 I always have a supply of nuts and seeds so I decided to get creating with a healthy blend of nuts, and melt down the chocolate to bind it all together (combined with a little coconut oil to help). The result is delicious. It was pretty easy, and you can mix it up depending on what you have in your pantry. Add some extra goodness like a seed blend (LSA for example) or some chia seeds. I added in 2 TBS of The Wholesome Co’s stress and mind blend. Roughly chop all of the nuts, lay on a tray lined with baking paper. Add in seeds, buckwheat and cacao nibs. Chop apricots and add. Melt down chocolate with coconut oil and pour over top. Make sure all of your nut mix is covered and place in fridge to set! Once hard, break up with your hands and place into air tight containers. I love peanut butter and jam on bread. Give me some thick grainy bread - toast it and I’m done. It’s one of my favourite things ever. I love the combo of a good quality peanut butter with a delicious fruity jam or jelly, so when Pics Peanut Butter here in NZ sent me some of their new Boysenberry Jelly to try, I knew I wanted to create a ‘me’ version of a PB&J treat. After eating several teaspoons straight from the jar (oops), I decided to make a wholesome PB&J slice that I could enjoy, and take me back to my childhood of PB&J sammies! I actually used the base of my Best Raw Caramel Slice recipe, added oats & peanut butter to the the mix to bulk it out a bit more, and then added a layer of the jelly mixed with chia seeds so that it would set. On top of that, of course, some Pics Smooth Peanut Butter. Swirl it around so it gets all mixed together! It’s goey, messy and utterly delicious. As much peanut butter as you like! Blend together all of the dry base ingredients until it becomes a fine crumb. Add in your wet ingredients and blend again. Mix will be quite wet. Place into the bottom of a 20inch pan and set in the freezer. In a small bowl, combine the jelly and chia seeds. Take out your slice and smooth over the jelly layer. Return to set for an hour or two. Once set enough, add some smooth peanut butter and swirl it around to get the PB&J blended. 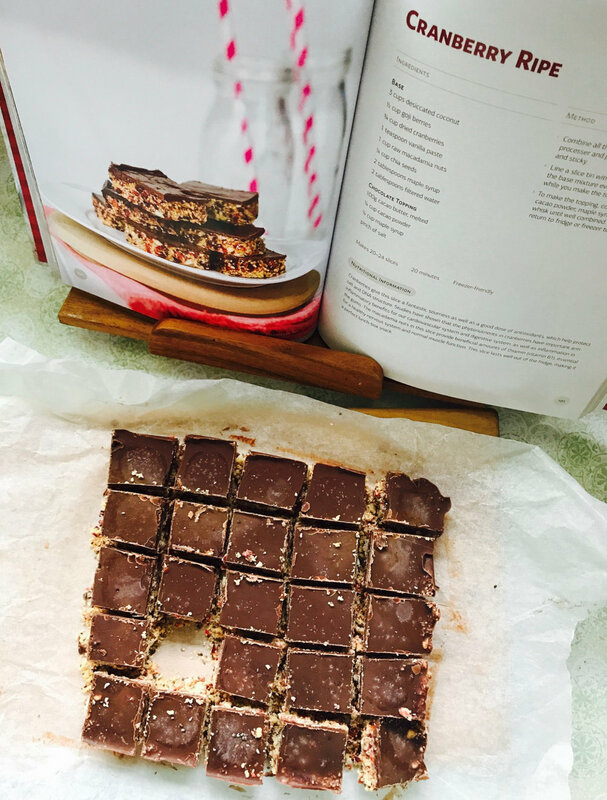 This recipe is up there with my absolute faves, like my Raw Salted Caramel Slice (see blog below this one), it is sticky, sweet and even good for you. This recipe comes from one of my fave little NZ businesses, The Wholesome Co. They specialise in wholesome baking subscription mixes plus wellness tubs. I am a fan. Being that I have a sweet tooth, having some wholesome treats on hand is such a plus for me. This recipe is from her Wholesome Treats V2 ebook and she has kindly let me share with you all. I recommend making a batch and popping them in the freezer for when the sweet urge hits! Soak both lots of dates in two separate bowls of warm water for around 10-15 minutes and drain. Place the almonds, buckwheat, coconut, drained dates, and coconut oil into a food processor and blitz until combined. Spoon the mixture evenly into 6 silicone moulds or muffin tin. Or you can make as a slice. Place the base mixture in the freezer while you prepare the banana layer. Place the banana, coconut cream, drained dates, vanilla maple syrup or rice syrup tbsp of the coconut butter into the food processor. Blitz until smooth. Pour evenly over the top of the base layer. Add the coconut oil chocolate into a small pot and melt gently. Spoon evenly over the bites and return to the freezer. 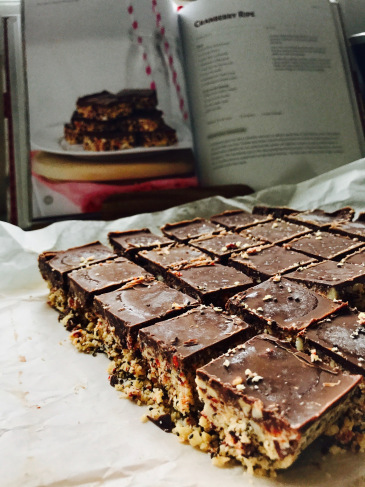 The Best Raw Chocolate & Salted Caramel Slice! I have been experimenting with buying raw treats over the past 7 months and discovering a whole new world of amazing refined sugar free treats. I've made some as well as I love to have a little stash in the freezer! I must confess that pretty much all of the slices I have tried have been really really good - both made and bought, much better than I expected. If you've ever doubted that raw can be as good as 'the real thing', then you absolutely need to try and see for yourself! Of all my experimenting, the one that always gets me, no matter where I buy it from, is a caramel & chocolate slice or peanut butter and chocolate protein slice. Holy moly, caramel made from dates and coconut cream is out of this world good. After dabbling with a few basic raw recipes I decided it was time to try the cream of the crop - a trip layer caramel slice. It's delicious, utterly drool worthy and not as hard as I expected. Want to give it a go? Here's the recipe, adapted from The Merrymaker Sisters. I'm gutted I didn't get any photos side on, and to be honest mine was a bit slapstick as I was in a rush - but in an ideal world, you should be three definite layers. PS - Remember this is a treat and not something you should go crazy on. Although refined sugar free, these types of slices are still high in natural sugars, so something you should eat in moderation. Good luck with that! Pop it in the freezer so that you don't get tempted to eat all at once. Using the food processor (again, don't worry about washing it) add the raw cacao, coconut oil and maple syrup, mix until completely smooth. Pour the choc topping over the caramel filling, shake the tin slightly to even it out. I gave it a bit of a swirl! Once set, cut into slices and store back in the freezer! 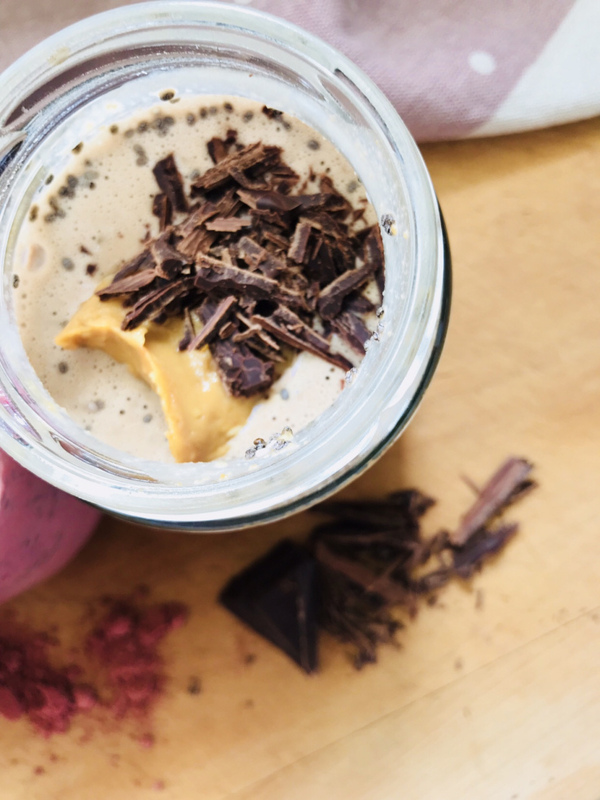 4 Must Try Chia Pudding Recipes! There are a few things that have become absolute staples in our house over the past 9 months, and chia pudding is one of them. So simple, easy and yummy. Plus, did you know Chia seeds are higher in Omega 3 that Salmon? Super duper good for you. They also absorb liquid, so you can pretty much create any flavour you want with liquid - and then just add the chia seeds to give it bulk. I have made many renditions of Chia Pudding, you can literally do anything, and I have. I've come up with a few absolute favourites that I'm going to share below, but first things first - I'm going to give you a recipe for a basic, plan vanilla pudding, and then you can use that as a foundation to build on. You can't go wrong with Blueberry or Chocolate Peanut Butter, plus I've just made a special edition pud using Misty DayPlant Potions tonic powder. Blitz or whisk together everything except the chia seeds. Once blended, add the chia seeds and whisk again. Pop in a jar and refrigerate for an hour. Prep your jar(s) by putting a little peanut butter in the bottom. Blitz together coconut milk, syrup, cacao, vanilla and peanut butter. Add chia seeds and mix with a whisk, pour into jar on top of the peanut butter. Prep your jar(s) by putting a 1/4 cup blueberries in the bottom. Blitz together coconut milk, syrup, vanilla and and 1/4 cup blueberries. Save a couple to go on top! Add chia seeds and mix with a whisk, pour into jar on top of the whole blueberries. Blitz together coconut milk, syrup, vanilla and the tonic. Add chia seeds and mix with a whisk, pour into jar and place some strawberries on top - they will sink, this is fine. I'm all about that sweet life. Even with balancing out my diet (and no doubt my hormones) I like to have something a little sweet now and then. This is slightly more effort than the Cranberry Ripe recipe I posted a week or two ago (see recipe HERE) but it is definitely more decadent too. It's best kept in the freezer in small portions, just pull out a piece when you need a pick me up or want a treat. If you let it defrost ever so slightly the middle layer goes all gooey and melts in your mouth. YUMMO! Sweet things never used to be safe in the house with me around, and I'm loving that I'm not having the same cravings I did before. 1.combine all of the base ingredients in a food processor and pulse until well combined and sticky. 2.Line a slice tin with greaseproof paper, press the base mixture into it evenly and place in freezer to set. 3.To make the peppermint filling, combine all ingredients in a high speed blender and blend until creamy and smooth. Pour mixture over base and return to freezer to set until very firm. 4.To make the chocolate topping, combine the cacao butter, cacao powder, maple syrup and salt in a bowl and whisk until well combined. Add the goji berries and buckwheat and mix well. Pour chocolate over the set filling and base. Place in freezer until completely set. I have been discovering some amazing recipes and new tricks in the kitchen lately. If you know me already, you know I love to bake, I even owned a baking business for a few years. I think my love of baking originally came for my love of sweet things, and wanting to recreate sweet treats that I had seen or had at a cafe. Nothing has changed really! At the Total Health Explosion event in New Plymouth last weekend I tried some raw treats from Raw Balance. They were GOOD. Seriously good. I couldn't believe they were so delicious! So I came home thinking 'I need to learn to do that'. I had totally forgotten that I had purchased a Dr Libby recipe book a few years ago (with good intentions) but never actually made anything from it. I think that 'raw food' has always intimidated me a bit, I'm more familiar with traditional baking - flour, sugar, butter - you could say it's my comfort zone. Well, I am happy to report my first attempt was a success (bulging eyes from Aiden and two thumbs up) and I couldn't believe how easy it was. Only 3 steps, and Aiden helped. I think some recipes can be more labour intensive than others, but if you're like me and want to give something a try, this recipe is the perfect first step. There are a few staple ingredients you will need that you may not have at home - don't let that intimidate you! I went to my local Bin Inn and bought some things I'd seen recurring on several recipes, and now they are in my pantry ready for my next experiment. Give this a go and ENJOY! I've included a few photos to help you. This recipe is best kept in the freezer in small portions to pull out when you need a sweet treat. Combine all the base ingredients in a food processer and process until well combined and sticky. Line a slice tin with greaseproof paper and press the base mixture evenly into the tin. Refrigerate while you make the topping. To make the topping, combine melted cacao butter, cacao powder, maple syrup and salt in a bowl and whisk until well combined. Pour over the base and return to fridge or freezer to set completely.